"Egg Painter" redirects here. For other uses, see Sinister Egg Painter. The Egg Painter Mouse is an Event Mouse found during the annual Spring Egg Hunt event. Information on how to locate and capture the Egg Painter Mouse can be found on the current Spring Egg Hunt event page. 14 April 2011: The Egg Painter Mouse was released as part of the Spring Egg Hunt 2011 event. 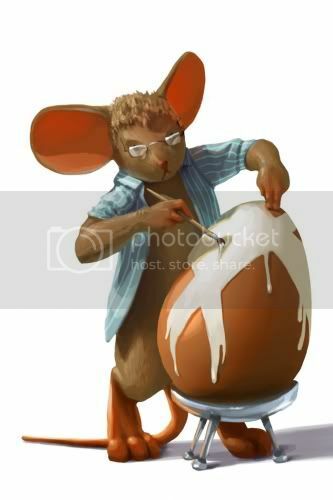 Creating beautifully painted eggs is no easy task and Egg Painter Mice take their role at the Gnawnian Chocolate Factory very seriously. Their eggs-pertly trained paws paint plaid print, red stripes, purple waves, pink scallops and other intricate designs. They spend their spare time along the east coast of Gnawnia dreaming up new masterful designs. This page was last edited on 17 April 2017, at 00:48.